The Lady Raiders put on a defensive clinic Saturday against Moberly Area. Through 20 minutes, Three Rivers had forced 19 turnovers and scored 25 points off those turnovers. The Lady Greyhounds tallied 21 total points in the first half on 33 percent shooting from the field. Three Rivers rode that tenacious defensive effort to a 73-47 win against Moberly Area to improve to 5-0 in Region XVI play. 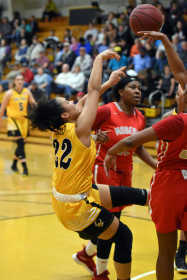 An'Nyah Pettus led the Lady Raiders in scoring with 11 points, but seven other players scored at least eight points for Three Rivers in a nearly perfect all-around performance. "That's balance; that's sharing the basketball; that's taking advantage of all the opportunities you're presented with. Just super effort offensively. Super effort," Three Rivers coach Jeff Walk said. Three Rivers' Jordan Little (22) shoots the ball as she's falling to the ground during the first half of a Region XVI game against Moberly Area on Saturday, Jan. 26, 2019, at Three Rivers. The Lady Raiders (18-3, 5-0 Region XVI) couldn't have asked for a better start in their wire-to-wire win. They scored the first nine points of the game and got out to a 17-2 start in the first seven minutes of play. "It'd be really nice to do that for the rest of the year. We were running and intercepting passes from their offense, and that just makes our offense easy because we're shooting layups and we anticipated as good as I've seen us anticipate all year long on some passes to get those steals. That was just textbook perfect," Walk said. Hailee Erickson scored the game's first basket with a 3-pointer courtesy of a skip pass from Kim Shaw. After a Deanay Watson put-back, Shaw got in the scorebook with a pair of free throws and a subsequent layup after she stole an inbounds pass and took it to the basket. "We really wanted to come out and show them because they'd been saying some stuff, and we wanted to prove that we were better and we can play and come out and compete every time," Shaw said. A baseline cut and layup from Taylor Lawson-Hicks got the Lady Greyhounds (10-12, 2-3 Region XVI) on the board for the first time with just under seven minutes remaining in the first. Four straight points from J'Kayla Fowler sparked an 8-0 run for Three Rivers, putting the hosts in the driver's seat for the remainder of the game. 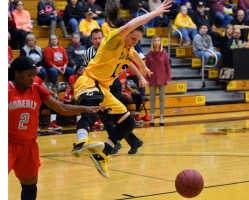 "We saw that they were playing a little slow, so we came down trying to run fast in transition and trying to get back on defense, and the defense slowed them down, so we got off to a fast start," Pettus said. Three Rivers' Hailee Erickson is stripped of the basketball by Moberly Area's Alexis Singleton during the first half of a Region XVI game on Saturday, Jan. 26, 2019, at Three Rivers. The Lady Greyhounds scored five straight points to cut the lead to 10 briefly, but the Lady Raiders responded with seven in a row to finish the opening frame ahead 24-7. Three Rivers took its biggest lead of the game in the third quarter with a 13-1 run to go up by 34 points at the end of the third quarter. Throughout the game, the Lady Raiders were using their active hands to either get steals and score points or force Moberly Area out of its offensive rhythm. "(The defense was) just backing each other up, and one of us gets a steal, just being there and running the floor and crashing the boards and rebounding," Shaw said. During a 14-5 spurt in the second quarter, Little came away with a steal and found Shaw for an open 3-pointer, and Fowler grabbed a steal near halfcourt and took it all the way to the rim for two. Three Rivers did what they do best — run the fast break and force turnovers — to outscore the Lady Greyhounds 17-8 in the third quarter. Three Rivers forced 29 turnovers in the game and scored 30 points off turnovers. Shaw led the Lady Raiders with four steals. The hosts finished with a plus-seven rebounding differential, securing 43 boards, 17 of which came on the offensive end. Next up for the Lady Raiders, they'll visit Jefferson (MO) at 5 p.m. Wednesday for another Region XVI matchup.